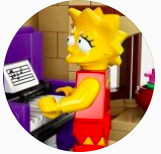 I'd made mention of this in the Brickset Builders Guild section, but figured it might be worth starting a new discussion since I'll be adding to it. 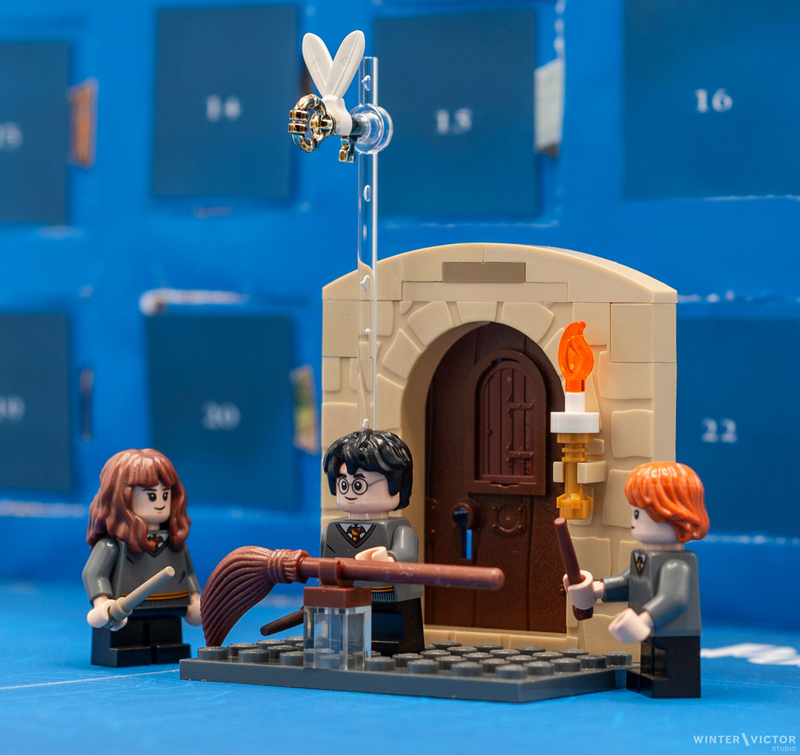 This year I have created a LEGO Harry Potter advent calendar for my wife, who is at the tail end of a master's degree and hasn't been able to do one of the retail calendars alongside our daughter (7) over the past few years. She was thrilled with the surprise reveal on Saturday and is enjoying it so far! In the spirit of official LEGO advent calendars, it's a mix of builds in various scales with a selection of minifigs scattered through the days. On the production side, I've repurposed and fully rewrapped last year's Star Wars calendar. (Graphics on the box borrowed from a freely-available Wizarding World coloring book PDF.) 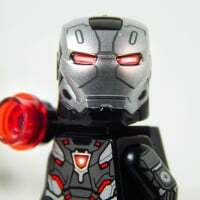 The builds throughout are mostly original, with inspiration drawn from official LEGO sets and other MOCs around the web. I'll note relevant items as we go. Here's the box. The production of the door panels was a little rough as I forgot the LEGO calendars have a staggered layout. Perhaps next year I'll build the whole thing from scratch, but for the first go-round this will suffice. Hope you enjoy this, and maybe with some luck we'll see an official version of this next year! I'd absolutely be in line for that. This is a fully original microscale version of the Dursley's home in Little Whinging. It's based mostly on the version of the house we see in Chamber of Secrets onwards, complete with the sunroom at the rear from which the inflated Aunt Marge ascends toward the heavens. I based this on stills from the films and images of the theme park Gringotts. I did look at the new version in 40289 Diagon Alley, but preferred to try the column structure you see here. The "actual" Gringotts has three stories above ground, but for the sake of piece economy I truncated it. 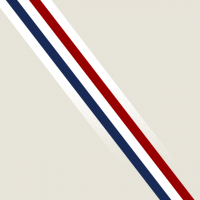 The Flatiron-style wedge shape was something I really wanted to include - and while this is a less-acute angle than the real thing, I'm pretty pleased with it. 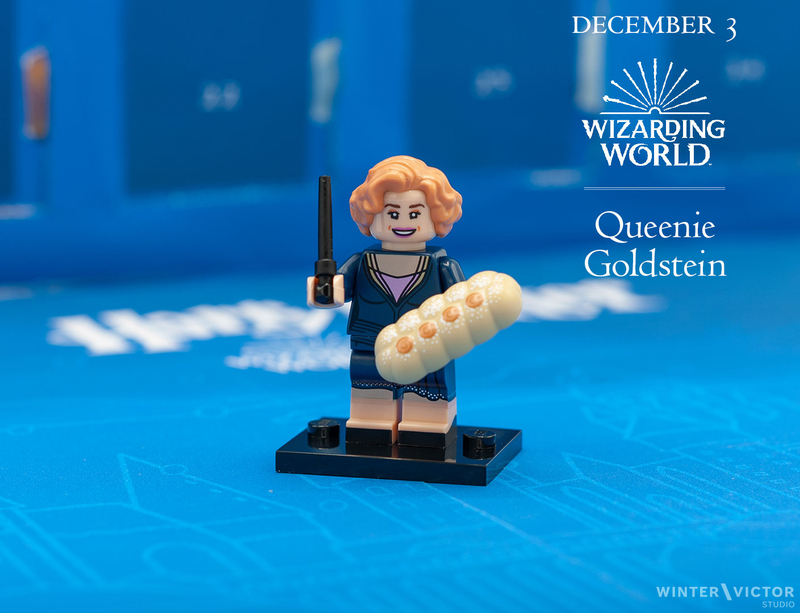 Door 3 is a sidestep into the wider Wizarding World, and so we have our first minifig, the recent CMF version of Queenie Goldstein. One of the things I was sensitive to was the days of the week on the actual December calendar. It was important to me to make sure I had smaller tasks for my wife on weekdays, as she leaves the house quite early in the morning for work, and has little time in the evenings as she continues to work through her remaining schoolwork. The first weekday of December seemed like a good time to check a box on the HP CMF checklist. 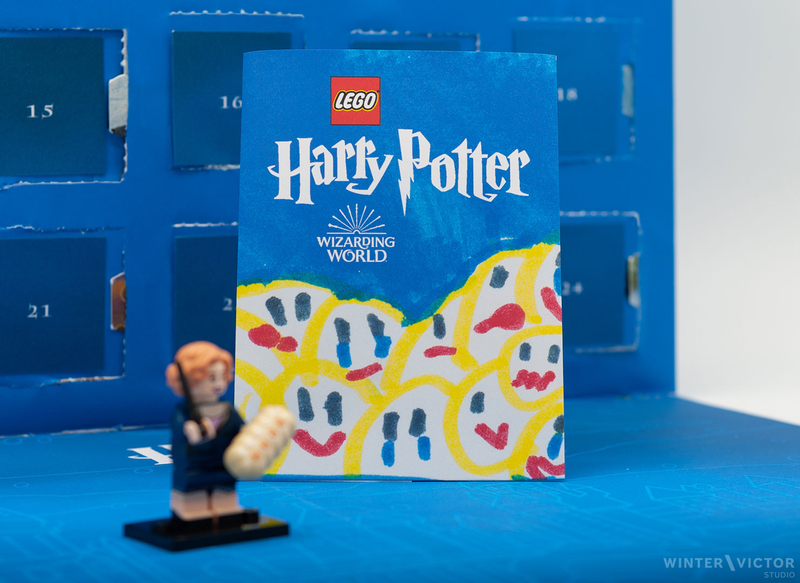 A fun detail in the calendar is a wrapper for minifigs. Months ago, when the HP CMF line was released, we bought some of them. Our daughter enjoyed it so much she made a game of designing her own blind bags, complete with various emojis to represent minifig expressions and even a hole for hanging on a store peg. She stuck random LEGO characters in them and made us pick one to see who we got. This was a pretty cute game and I remembered it at the last moment in production, so I took her original drawing and adapted it for the calendar. A fun surprise for both my wife and especially my daughter. This is fantastic! The thought you have put into this is amazing. The minifig packets are such a sweet detail. My wife and I will be checking this thread daily, if possible. Well done! looking forward to the rest of the reveals! just awesome - can't wait for tomorrow! This is really nice. Looking forward to seeing more. 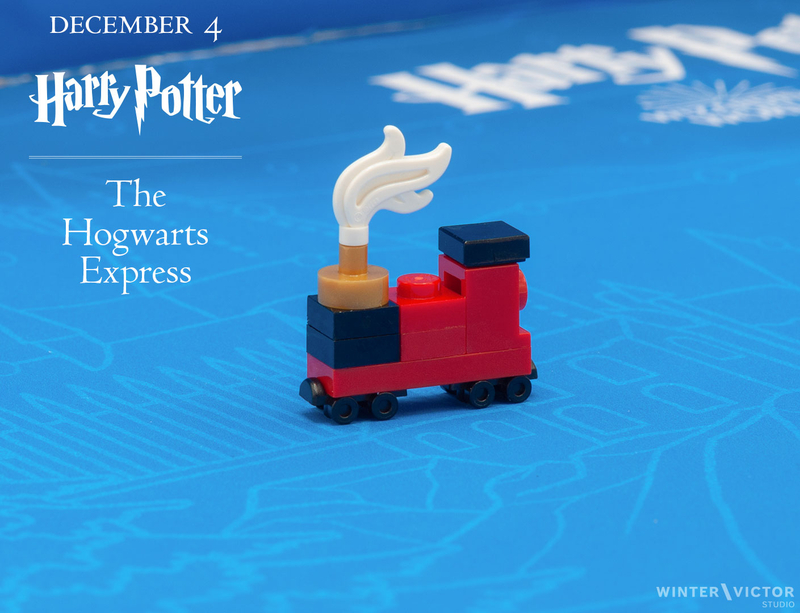 Door 4 bring us: a microscale version of the Hogwarts Express locomotive! I really liked the use of roller skates as wheels, but made a number of other changes to feel a bit more like the actual locomotive. I have a copy of 75955 Hogwarts Express, and referred to that for adjustments. I also wanted a more whimsical plume, in addition to capturing a bit of gold coloring. Pretty happy with this, and I think my wife enjoyed building something after having a minifig appear the day before. What a brilliant idea. The Express is just amazing, the rollerskate wheels are a little small, but they work perfectly with the comedy smoke stack! 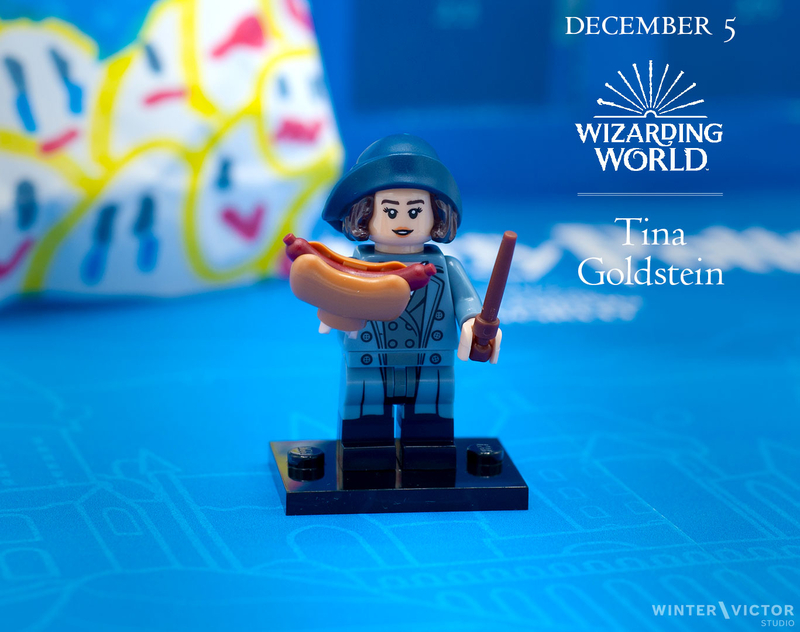 Door 5: Tina Goldstein, to complete our family collection of the Fantastic Beasts protagonists! Love the hot dog. It's an essential NYC accessory. "Get your red hots!" 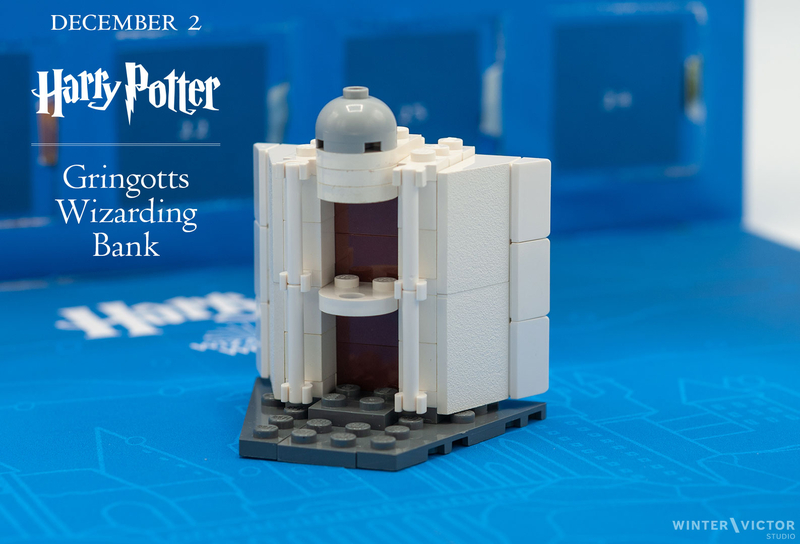 Door 6, and we're back firmly in Potter's era. 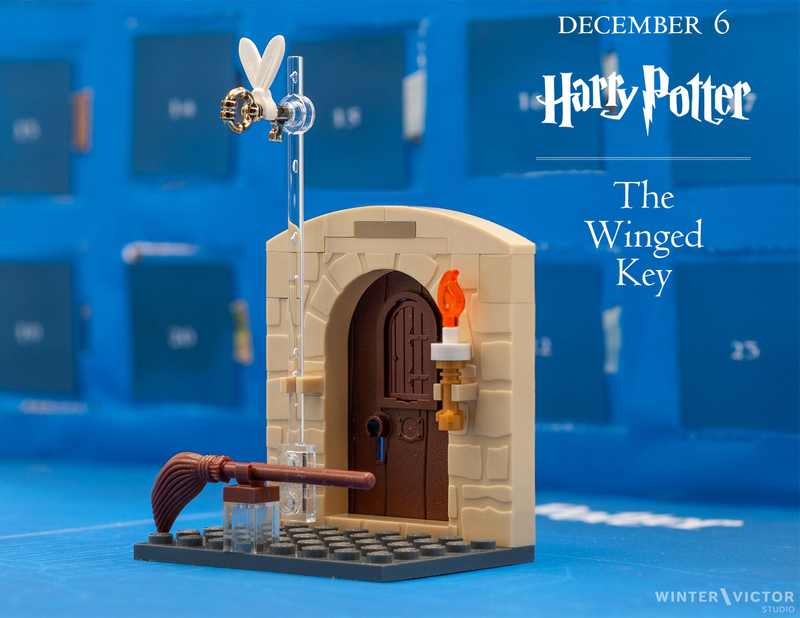 Today we have the Winged Key challenge from the Philosopher's/Sorceror's Stone. This one's a tiny bit of a cheat as the wall panel and trans-clear handle don't actually fit in the box. I had to hand them to my wife after she pulled everything else out. But I don't regret it at all because they're so effective! But I really wanted to have a working door in the scene, and liked the idea of clipping the feathers on the key itself. The waiting broom was essential to my mind as well. More than one key proved to be a bit costly, and anyway only one key works, and we have this handy clip ready to go on the door panel. The other side got one of our spare candle flames from the new Hogwarts sets, and a pleasant rounded top to finish it off. Add in our gang of heroes and the scene is set. 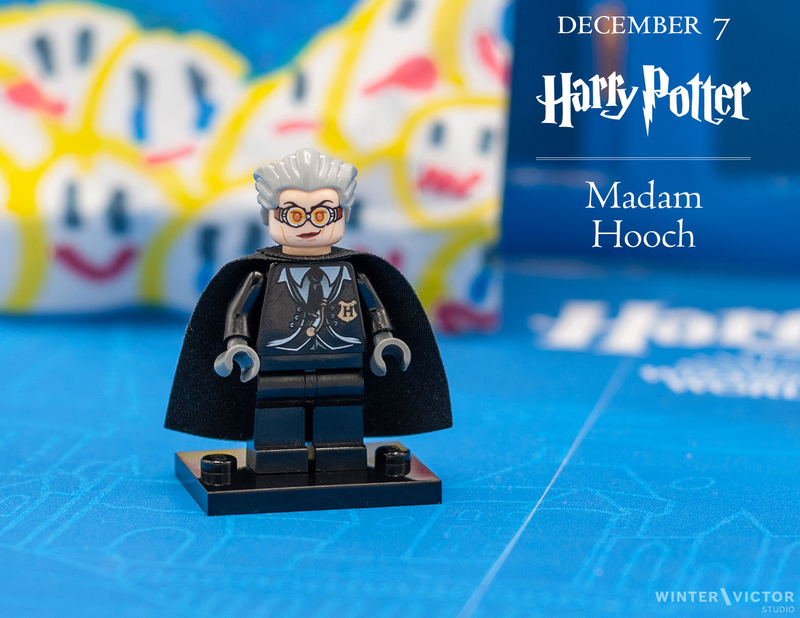 Door 7: Madam Hooch! Interestingly, we still don't have any kids represented in this calendar. But now we have a teacher, with Hogwarts’ iconic Quidditch instructor. 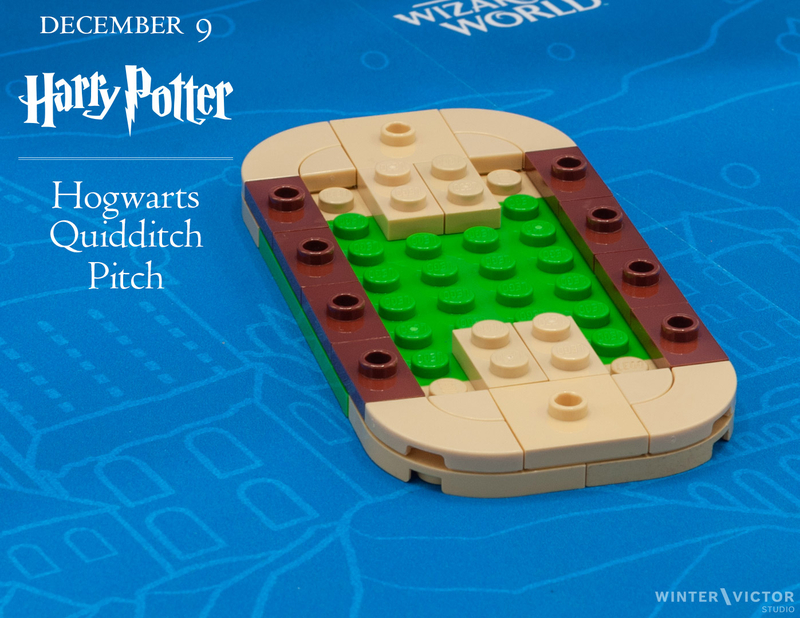 This is the version of Rolanda Hooch included from 2010's Quidditch Match, as opposed to this year's only theoretically available Bricktober pack. 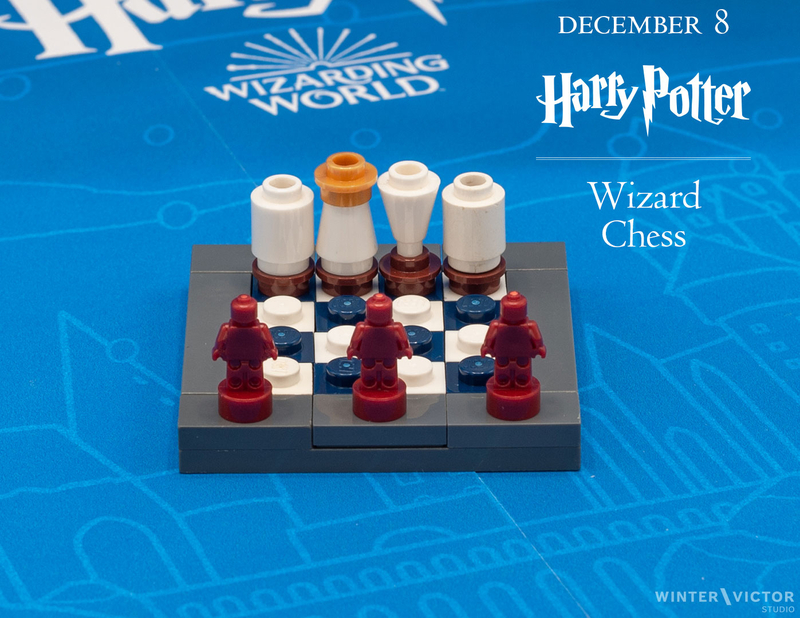 To start the second week of this calendar, we have behind Door 8 a rendition of the Wizard Chess challenge from The Philosopher's/Sorceror's Stone. 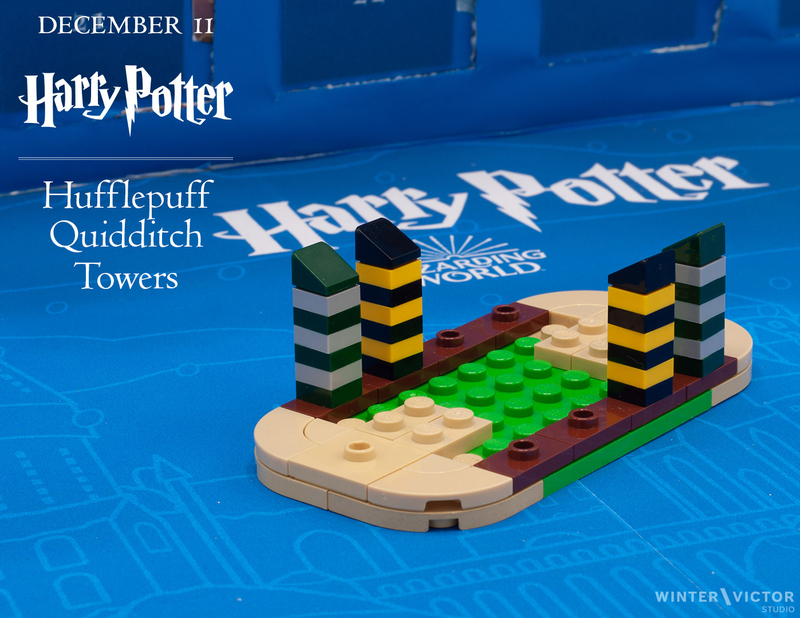 The game board color palette is drawn from the micro vignette in 71043 Hogwarts Castle. I created four representative opponent playing pieces on pedestals and used the neat little dark red microfigs to stand in for our first-year Gryffindor heroes as they approach the board. Today's was a hit here at home! Yeah, I'm wondering if I ought to submit it in some fashion. 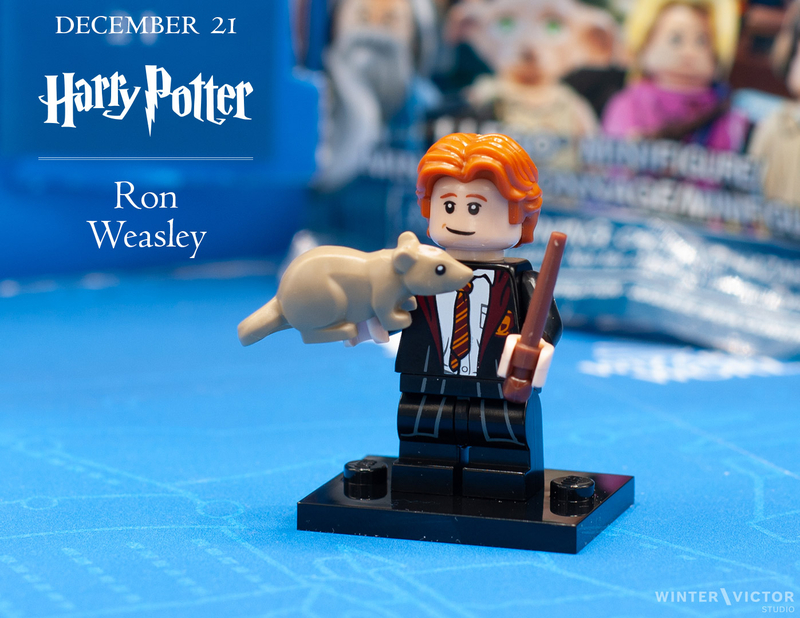 LEGO really should do an HP calendar - they'll do exceedingly well with it. 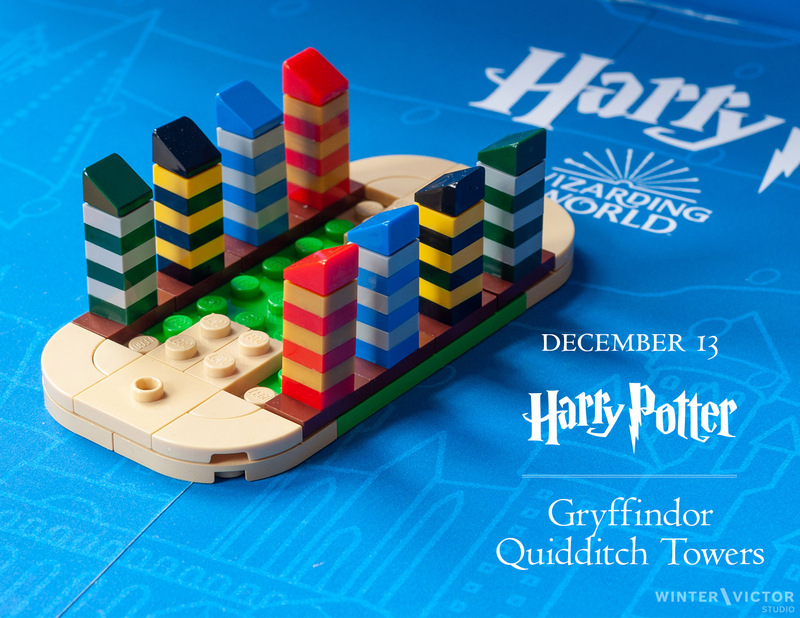 HP is definitely holiday-friendly! Amazing calendar! And I love how you adapted your daughter's drawing. Really cool gift. I had no idea they did a Castle calendar (at least two?). Just looked it up - cool! 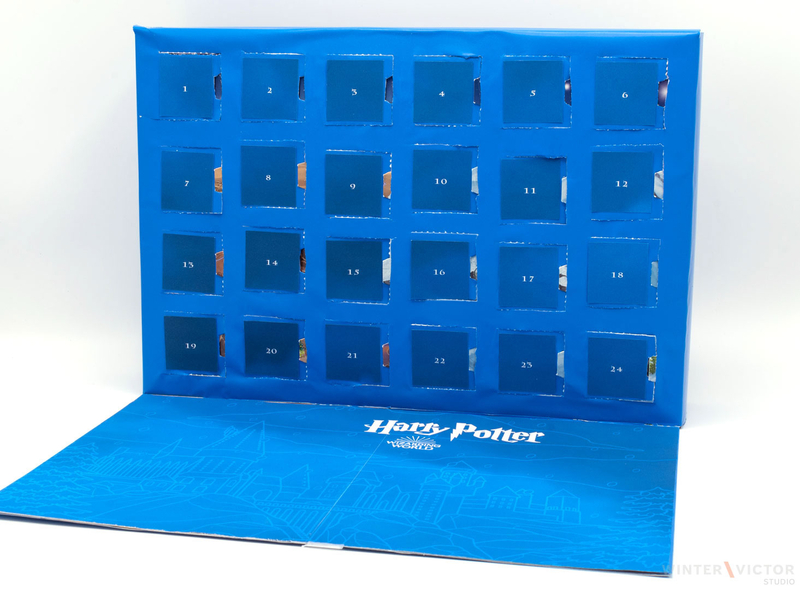 Fantastic beast of an Advent calendar! Btw, TLG won’t pick Ideas projects based on IP they already have in their portfolio. Thank you! Yes, that's correct, which is why I can't just dump it into Ideas. 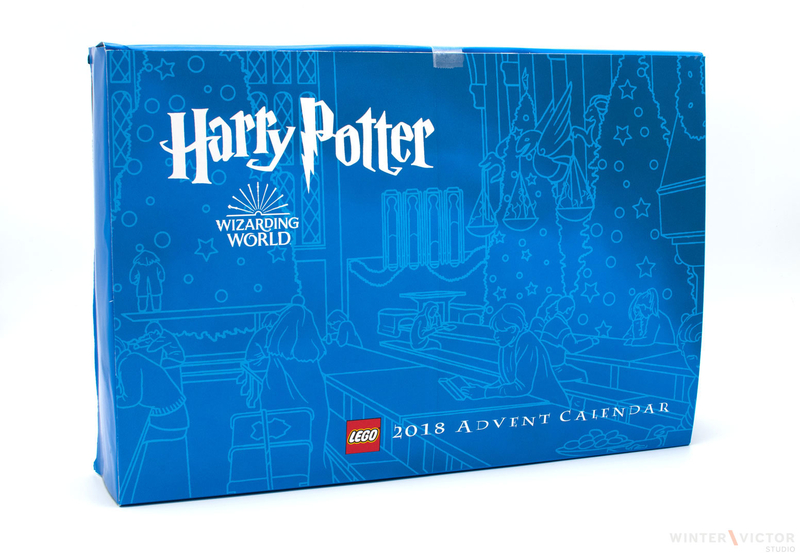 Most of these are too part-intensive for a retail calendar either, except for the Hogwarts locomotive, and maybe 4 Privet Drive. 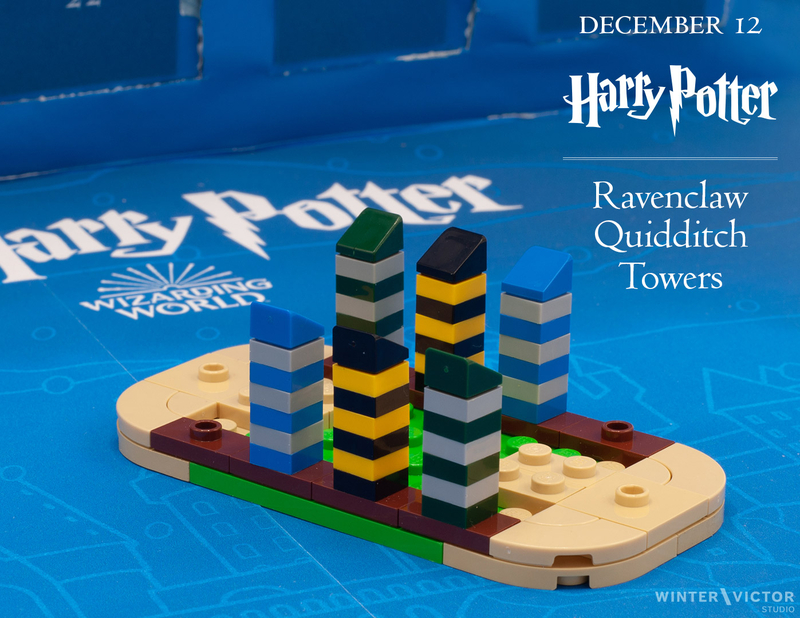 That said, the giant Hogwarts Castle set is full of microscale scenery, so I bet they could easily mine that for some daily builds. Really loving this! Well done! Jealous. What a brilliant idea! This is very vwry cool, and I love all the little personalised details. One very lucky wife. Back on track now! With Door 10 (way back on Monday) we start building up the Quidditch arena. The next few days are pretty minimal with an eye to what was anticipated as an extremely busy week for my wife. 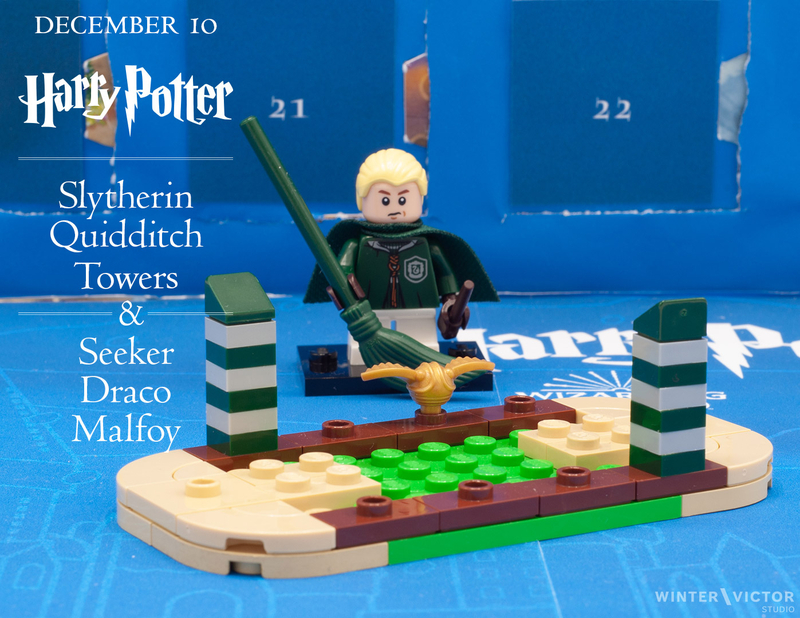 We start with Slytherin, and as an added bonus, Seeker Draco Malfoy! Why so grouchy, Draco? Still can't catch that snitch, huh? Ooh I wonder what could be next...! Catching up after a few scattered days! Door 13 is no surprise to anybody, it's Gryffindor Towers! 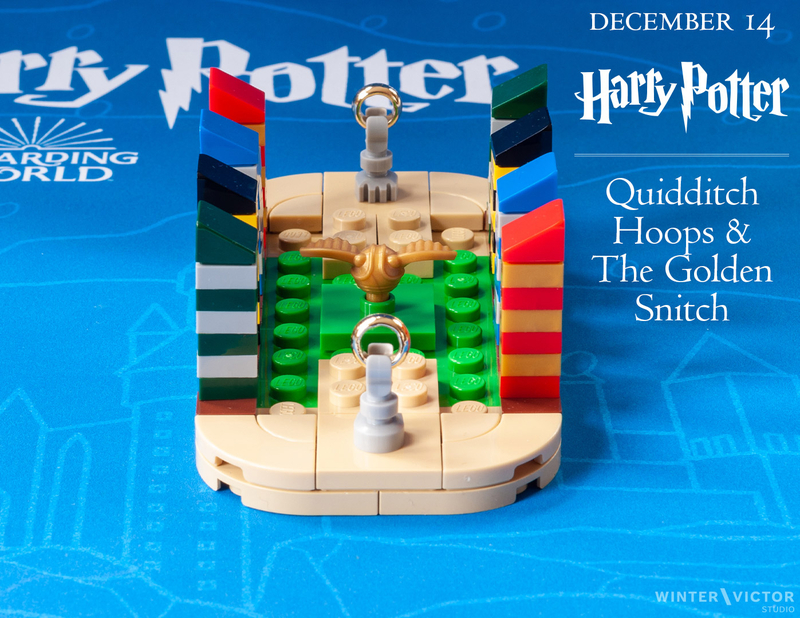 Door 14 sees us wrap up a hectic workweek before a hard-earned winter vacation, and fittingly, we finish up the Hogwarts Quidditch Pitch with a pair of hoops in the ends and a golden snitch for the seekers to race after. I went through a few iterations with different methods of representing the hoops, but a single hoop in each end seemed like a reasonable abstraction of the three that should normally be there. It was also a good balance in terms of managing cost. Overall we're very pleased with the end product. Door 15 gives us our first real hiccup. 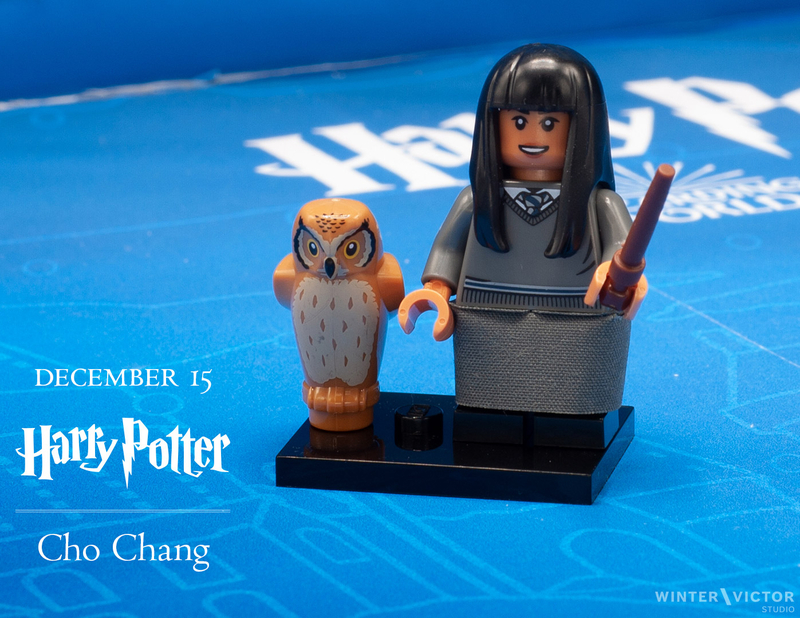 Finishing off the Quidditch theme, we have Ravenclaw Seeker Cho Chang (though only in her normal Hogwarts robes). Unfortunately her head is missing! Perhaps this is a statement on her unfortunate (unintentional) outing of Dumbledore's Army, but really the Bricklink seller goofed and I didn't thoroughly check the cramped ziploc bag. Luckily the seller is already on the case and we have a replacement head on the way. Sad! After a quiet week of minimal building we're about to get busy again with Door 16. Stay tuned. Now, for something a bit more exciting! 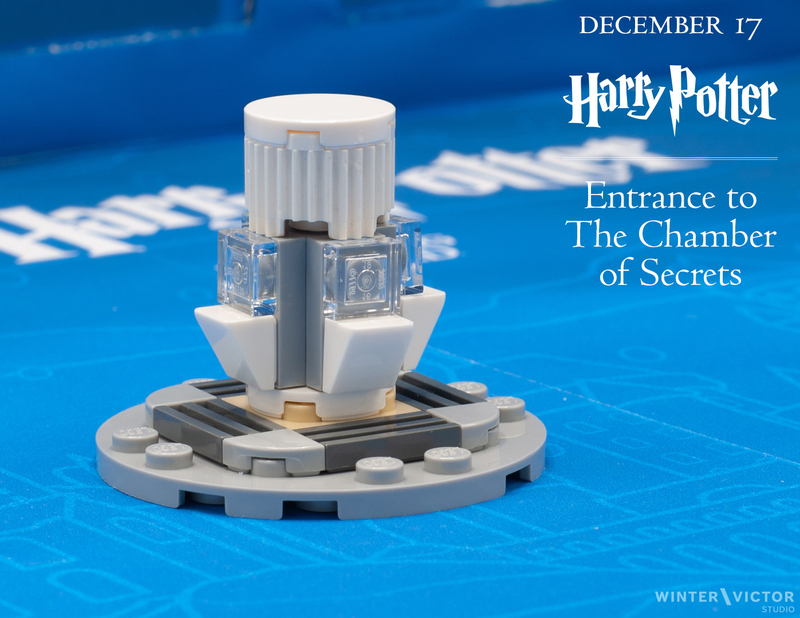 Door 16 reveals: a microscale rendition of Hogwarts Castle! 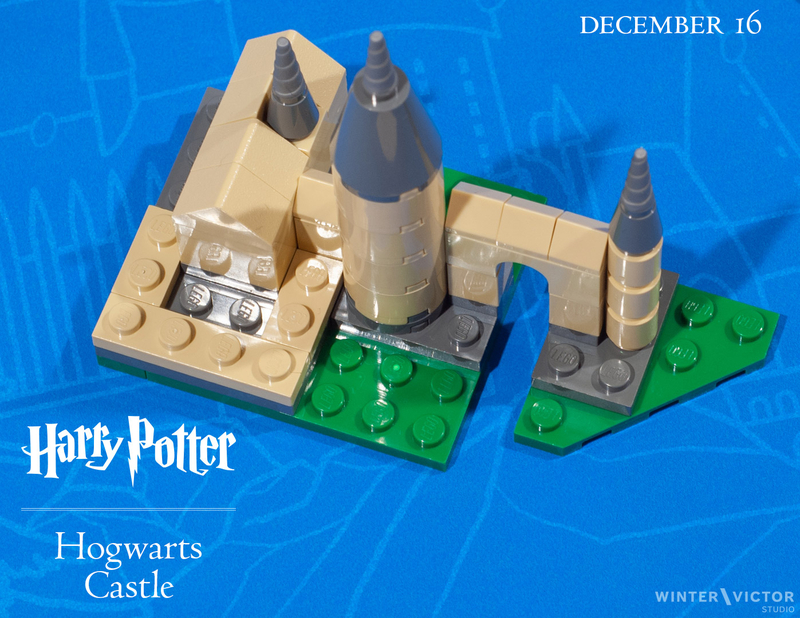 A bit of inspiration from a number of sources, including a great many other small-scale versions of the famous castle, and the newest official Lego sets. But the primary model for this was really the incredible Warner Brothers movie prop. I learned a pretty interesting lesson about digital building on this one. 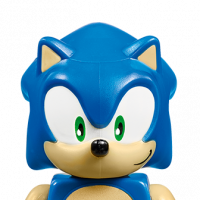 While doing my test-build before packaging I realized there were some unsteady connections in the original digital model, so I had to fix it manually and then go back and redo the instructions I'd created. Always good to double-check and do some testing! i'm loving this advent calendar, well done. It's been a bit of a here-and-there week, so let's get caught back up. 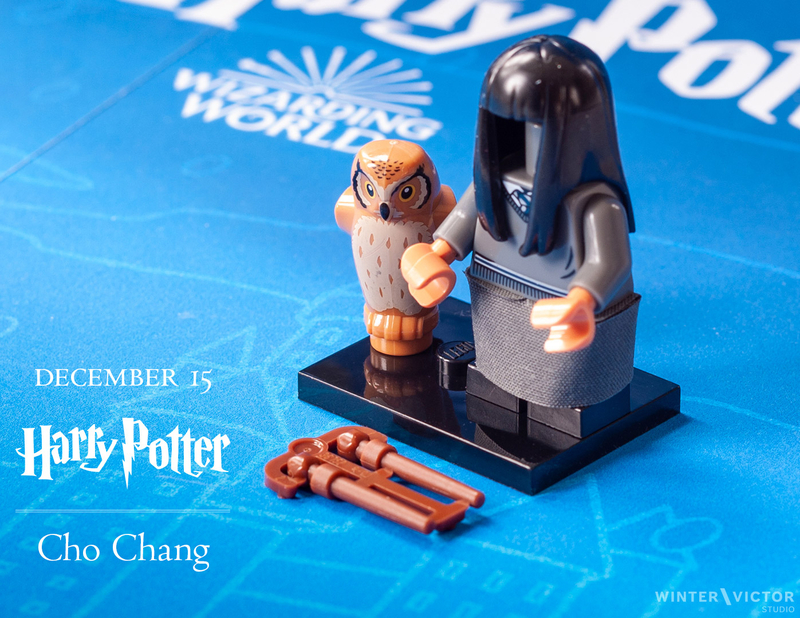 Firstly, Door 15's Cho Chang is no longer Headless Cho Chang. Thanks to my Bricklink seller for immediately shipping out the missing head! 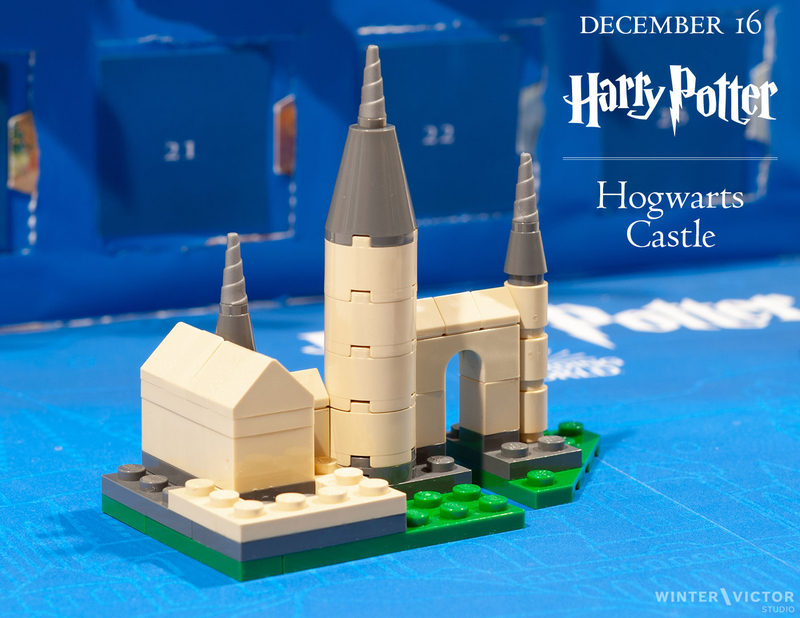 Door 16 was Hogwarts Castle (above). 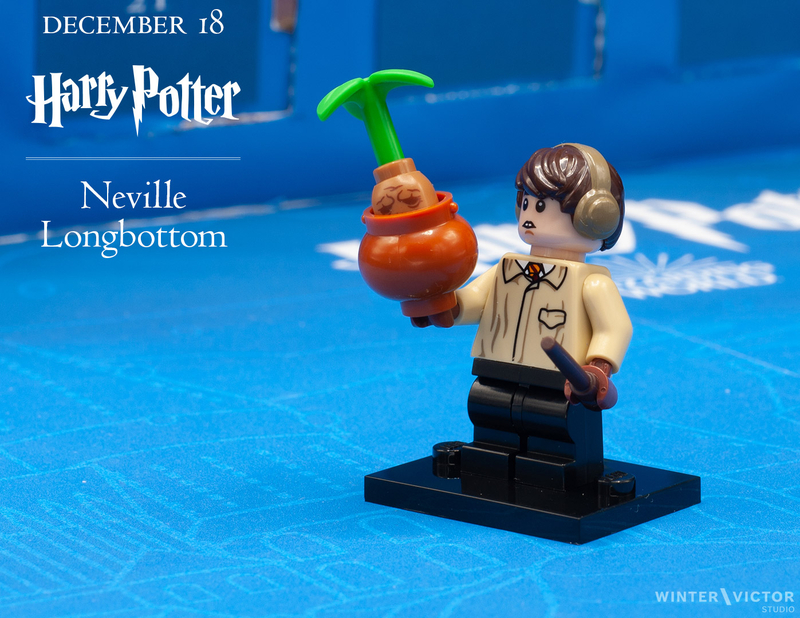 Door 18 was a crowd-pleaser here: family favorite Neville Longbottom! This is one of the minifigs from the 2018 collection that my wife wanted the most. So, it was a must to appear here. Who doesn't love Neville? And the mandrake is a really fun inclusion. Getting into the homestretch now! 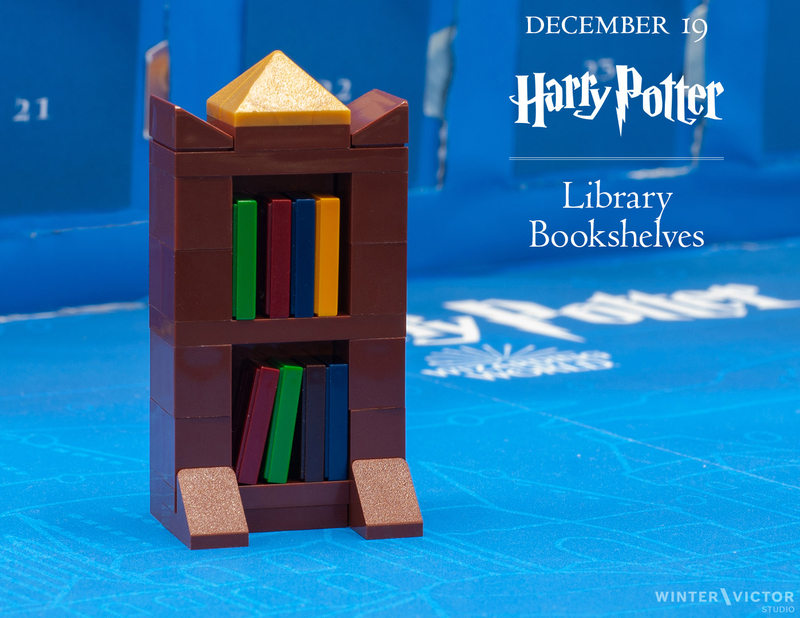 Door 19 is a Library Bookshelf, symbolic of the importance of literature in the Harry Potter series. The characters spend a great deal of time in the Hogwarts library, and books are constantly discussed throughout the 7 novels. Also, Harry Potter is, fundamentally, a series of books. My wife is a book lover herself so this felt like an appropriate thing to create. From a personal perspective, I've enjoyed the 1x2-tile-as-book-spine I've seen in so many places, and wanted to give it a go. It was fun to pick some contrasting colors against the wood-brown bookcase, too, and include some steadying feet and a dash of ornate decoration at the top. Door 20 is a chance to visit another important location: the Weasley family's home. 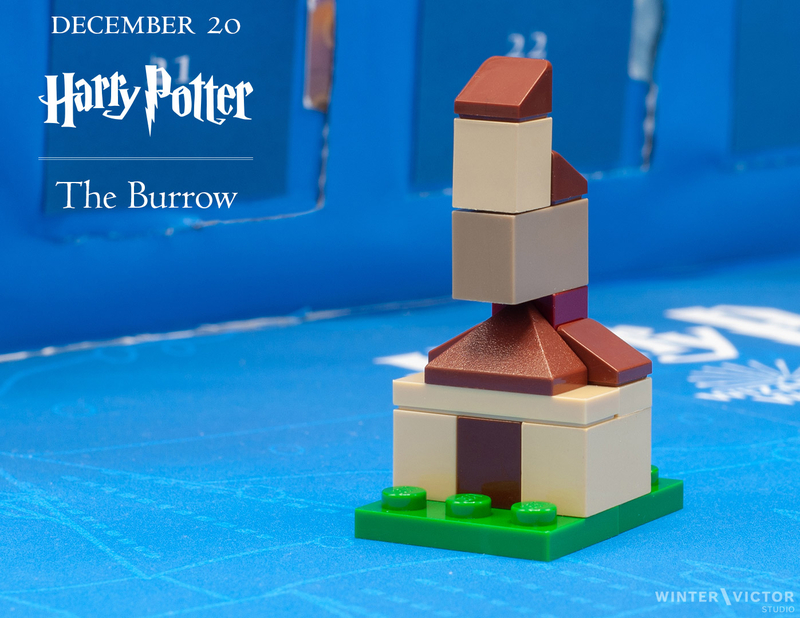 The Burrow is a place of refuge for the characters in a variety of ways throughout the stories, and it's really fun to build such a weird structure. 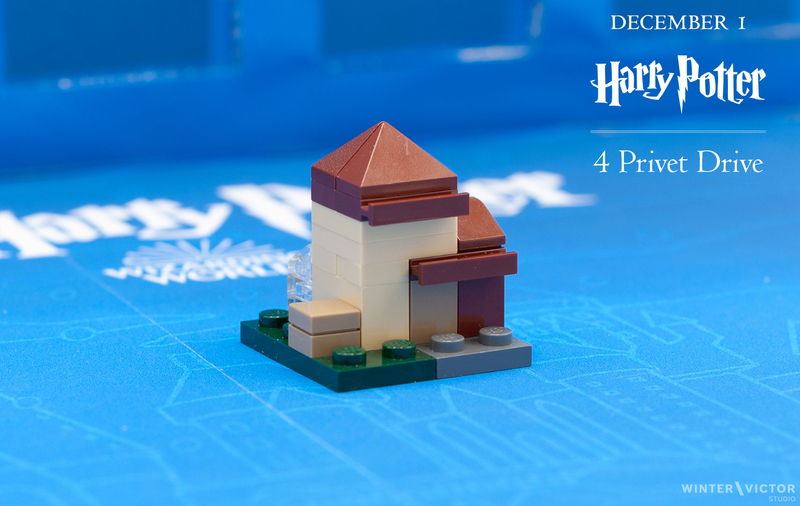 This one fits with the scale of 4 Privet Drive from the very first entry in the calendar. Just a few more to go! I hope you've all enjoyed this as much as we have here. It's already been strongly suggested that I do another one next year, so if anybody has any suggestions for inclusion, I'd love to hear them! I have a few ideas already, but 24 doors is going to require a lot! 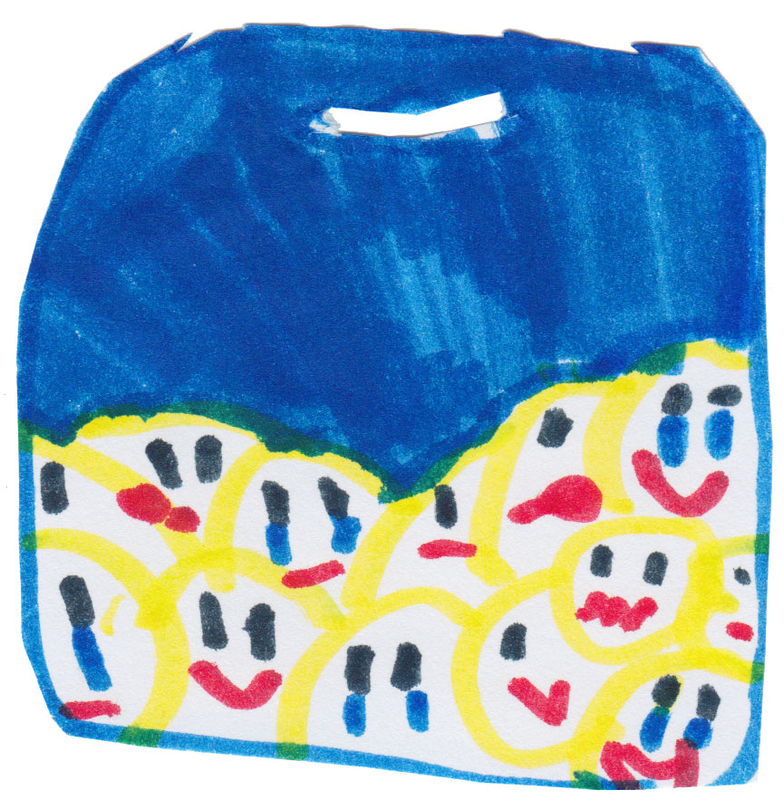 Door 21: Blind bag roulette! This is the one day which was a total gamble, especially considering how many of the CMF figures we've already covered. While I "had a feeling" that I knew what was in this one, I wasn't entirely sure. Nevertheless, I placed it after The Burrow hoping for good luck, and tonight we were rewarded with Ron Weasley! And the turncoat Peter Pettigrew. Uh, I mean Scabbers. 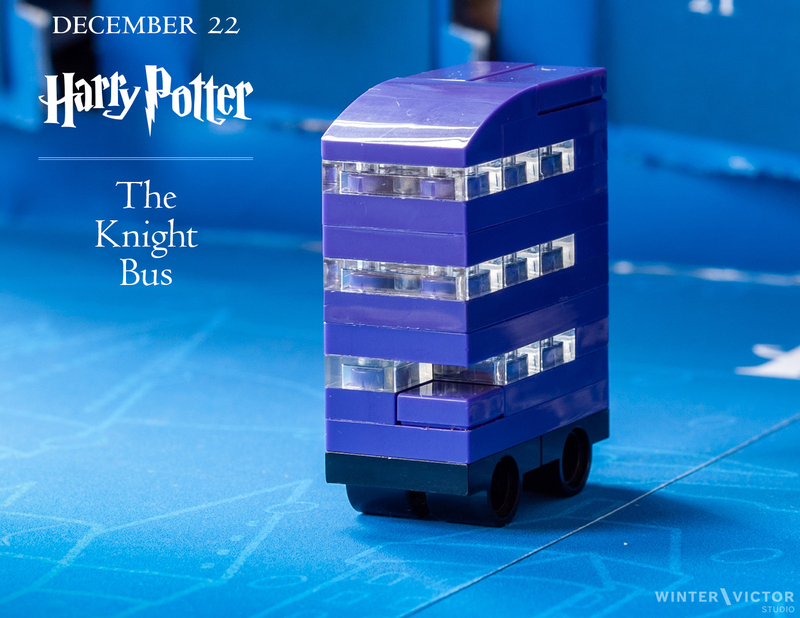 Door 22 jumps us ahead a book to the Prisoner of Azkaban, recalling one of the most delightful segments in the whole series: The Knight Bus! A definite hit here this morning. The Knight Bus has appeared in three official sets at different scales; my version is closest to 4695 Mini Harry Potter Knight Bus, yet a bit smaller. For the bus wheels I used the same pieces that served as the base for the non-rolling luggage cart in 30407 Harry's Journey to Hogwarts. 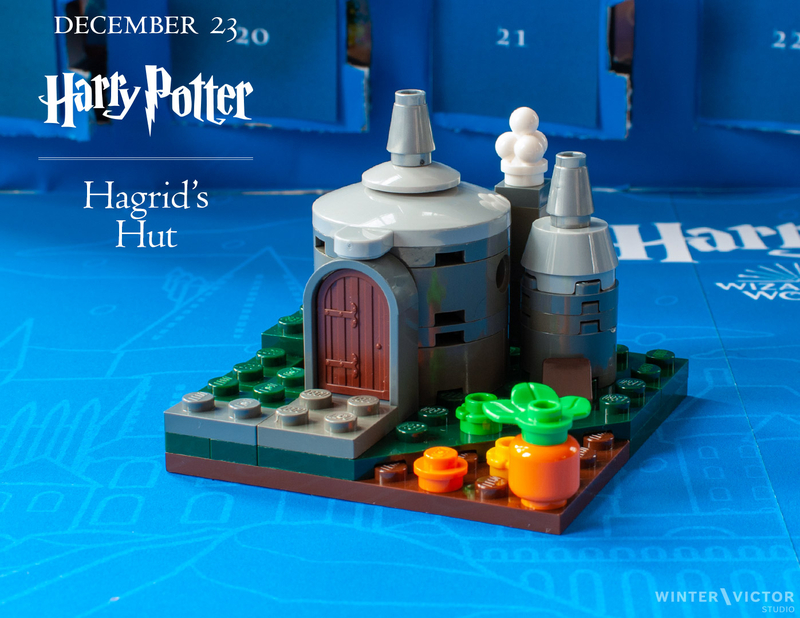 Door 23 brings us one of the most iconic locations from the series, Hagrid's Hut. This one takes some inspiration from a couple of places, including the miniature in 71043 Hogwarts Castle (the roofs) and the really great version by Jonas Kramm (especially the door & pumpkin patch). This is such an important element of the stories, and I thought it worthy of a more involved effort. The parts barely fit in the box's compartment! I had a fun time mixing old & new dark grays in this one to simulate the variegated coloring of stonework. Finally, we come to the end, as we do in all things. 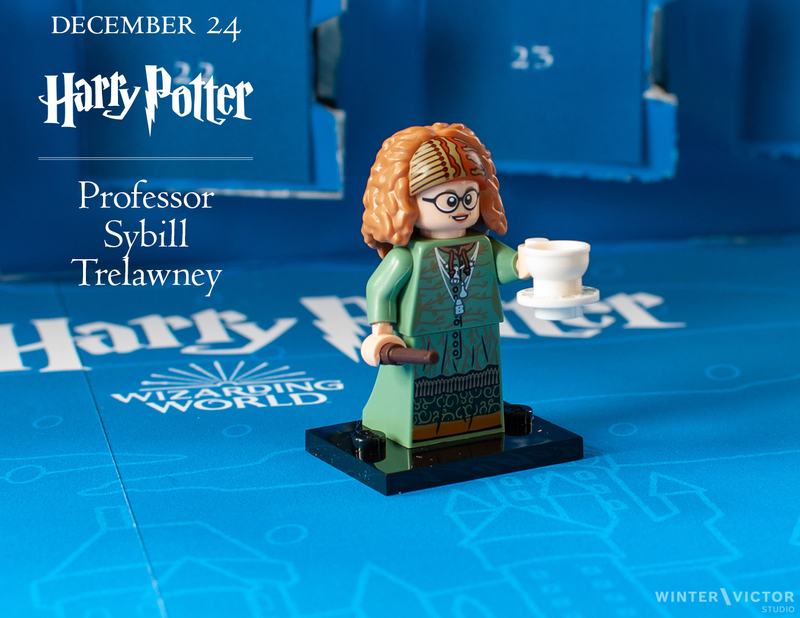 Door 24 is much-anticipated here at home, and it does not disappoint, revealing one of the weirdest yet most important characters in all the books, Professor of Divination Sybill Trelawney! Lego really did a wonderful job on this minifig, and she's a real hit here! Look at that hair and teacup! Great stuff. It's been a lot of fun designing, plotting, and assembling this calendar, and the daily reveals were totally satisfying at home. I hope you've all enjoyed it too! I'll get an overview up here in the next day or two as well, and am already starting to plan next year's edition. With any luck, the good folks at LEGO will see a smashing opportunity here and make an official version of their own for 2019! Thanks for reading and commenting, and Happy New Year to all! Thank you so much for sharing this with us! You've given me so many great ideas for next year! Happiest of holidays! Lots of fun seeing what went in, as I don't have an Advent Calendar myself. Beautifully created and photographed. A very Merry Christmas to you and your family! Thank you for sharing your ideas with all us Bricksetters. I really enjoyed this, thanks! Merry Christmas and Happy New Year to you and your family!